Finding a good vintage coping saw can be challenging. 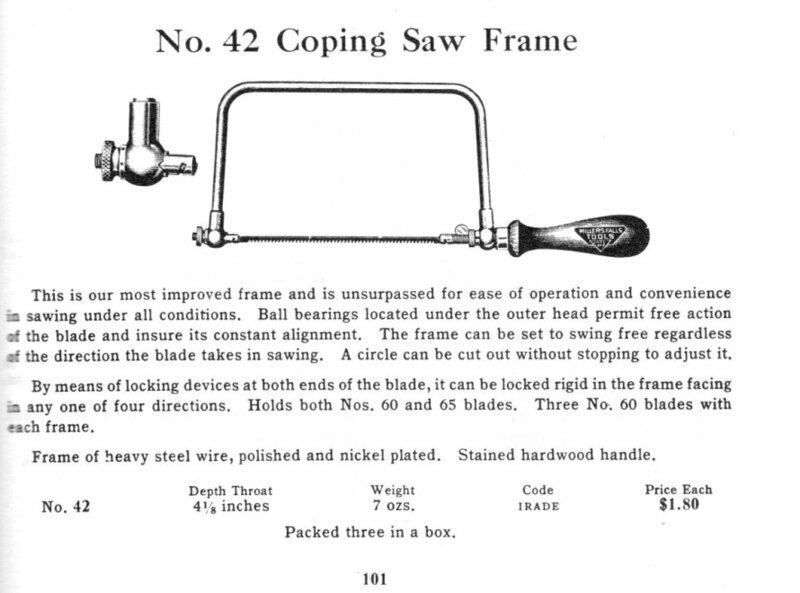 A few years ago Christopher Schwarz wrote about the Millers Falls No.42 coping saw on his blog. Shortly afterwards trying to get ahold of a No.42 became very challenging. I searched for a few years, and as luck would have it ended up with three saws last year. What’s interesting is that the three don’t look the same – for quite a while I thought one of them was missing a part of the adjustment mechanism – but things aren’t always what they seem. This required further investigation. Fig.1 shows the catalog entry from 1938. This version of the No.42 is the one most often seen, and sports the adjustment knob at the end of the saw, which wasn’t specified in the original patent.